I bought these for no reason whatsoever. I stopped by work to pick-up my check, and saw that these boxes came in today. $2.99 per pack, and figured I would give them a whirl. Apparently they chronicle each teams entire season with one card per game (annoying) making the complete set well over 4,000 cards. I may develop an interest in the Yankees season, but probably not. 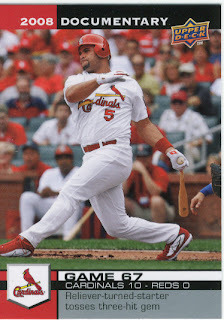 As of now I just whatever Cardinals cards that Pujols is on. I managed to get one, miracle that was. 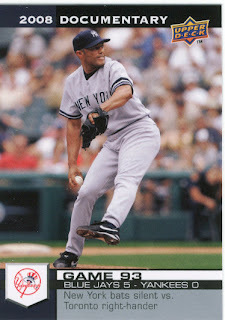 I only got one Yankees card with Mariano on it. 4 packs, 60 total cards- 3 YSL cards, 1 Pujols, 1 Yankees, and 3 gold parallels. I got 7 Cubs cards which was the most of any team. Oddly enough, no White Sox which I purposely looked for, for Eric over at White Sox Cards. The bright side is for three bucks, you get 15 cards. The downside is that the cards are pretty boring if you ask me. That's why you bought them. I appreciate the effort of looking. I haven't seen any of this in the Houston area. I'll buy a couple of packs just to have some. if you want some Astros, let me know. And if you get any Pujols, hold into them for me if you don't want em. I thought the whole purpose of this ridiculous set was that each card would have a picture from said game. 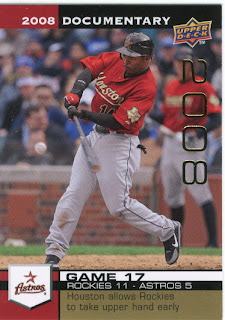 That Astros card (which talks about a game against the Rockies) looks like it was taken at Wrigley Field!!! Definitely not the case James, lol. The cards that I did get and went through used the same pictures over and over, i.e. Ryan Theriot of the Cubs. Upper Deck is making me cranky in case you can't tell by the garbage response I got from them. That's really too bad. This set had potential. My guess is that UD didn't have someone at every single game this year and would have to pay AP or a newspaper the rights to their photos to use. This way they just use a photo of a player from when their photographer was at a game. It's cheap and the way it is.